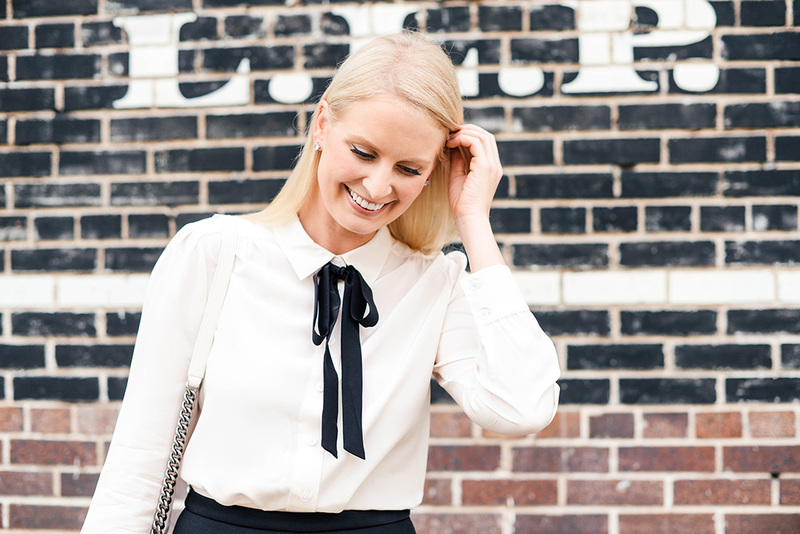 There’s nothing quite like a bow-tie blouse to make you feel professional and polished at the office. I love the feminine touch it adds to an otherwise simple button-down, don’t you? Two of my favorites have been by none other than kate spade new york. About a month ago you saw this one, and I recently decided to add this black + ivory blouse to my wardrobe. I can’t wait to layer it under my favorite crewneck sweaters once the weather cools off! It’s a tailored, year-round basic that’s wearable during the work week or on the weekend. The best part about it? This top comes in three different color variations! This embellished cardigan is an adorable addition for any 9-to-5’er. 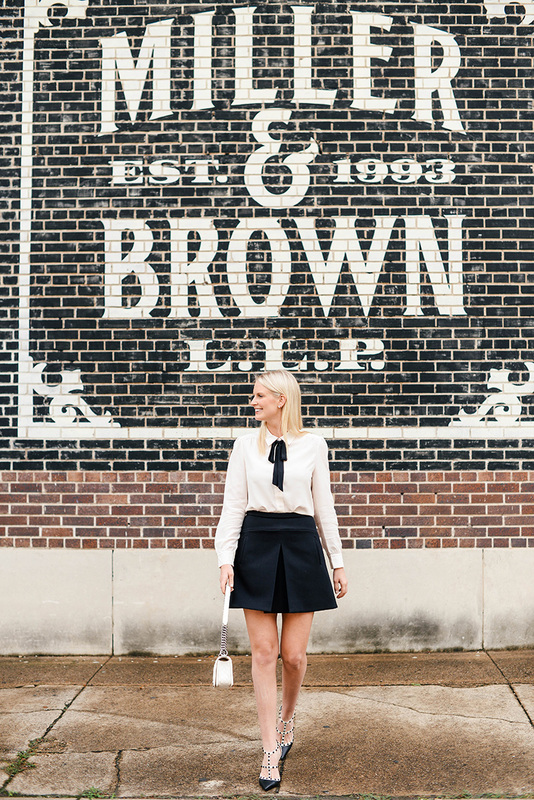 I never miss a chance to add classic leather pieces to my wardrobe – this A-line skirt is no exception! So gorgeous! If you’re looking to update your fitness wardrobe, check out these floral leggings. So pretty! Add some sparkle to your step this holiday season with a pair of glitter pumps! Here’s another beautiful blouse to snag for your work wardrobe. Would look fab with black jeans and heels for the weekend too! This outfit is simply stunning, you look fabulous lady. This getup is the cutest! 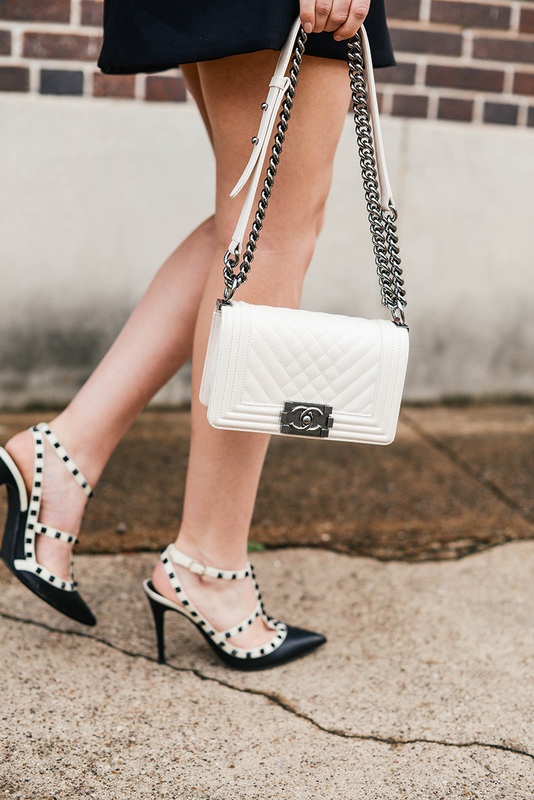 Love this black and white duo so much – especially that little bow. You look so great, Merritt! Love the outfit. Beautiful, Merritt! Love the styling. What a cute outfit! And I love that bag! So chic!! Loving that skirt on you! Beautiful! I love the tie-neck trend. This top is perfection! So chic! The perfect outfit for so many occasions. Hope you had fun in Austin! I love this black and white outfit and that beautiful bow-tie blouse! I think it will look adorable under crew neck sweaters! Love your black and white and that pretty bow blouse. Talk about the perfect shoes for this look too! I love this back-to-school outfit. You look really pretty. LOVE those two tone Valentino heels! Obsessed with this preppy chic look!